Ilikai Marina #388 - FREE PARKING! YACHT HARBOR VIEWS! 1-bedroom with AC, WiFi, Washlet! FREE PARKING! Palm trees frame beautiful ocean and marina views from this conveniently located remodeled 1-bedroom condo (651 sq. 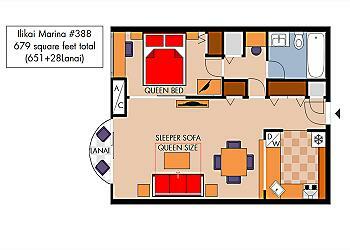 ft. plus small balcony/lanai) with central A/C. 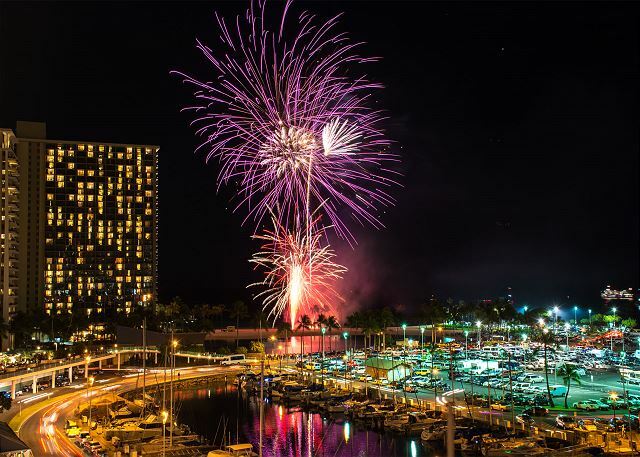 You’ll enjoy spectacular sunsets and a fabulous view of the Hilton’s Friday night fireworks too! - Shower/tub combination with hand-held shower wand. This non-smoking accommodation sleeps 4 and is not affiliated with Ilikai Hotel. Mahalo, for the wonderful review and recommendation! We're delighted to have provided all of the needs you required for an enjoyable Holiday stay! We're so glad that you appreciated the convenient location and views of this great condo! We look forward to seeing you again on your next visit! Was in a wonderful location and had a great view. They do need to work on the laundry room issues. A lot of machines not working properly. Took a long time and 4.50 to dry our clothes. Aloha and mahalo for taking the time to post a review about your recent stay. We're glad you appreciated the views and convient location of the great condo! We are sorry to hear of the laundry room issues of the building. I will pass your feedback on to the team and building manager to get them repaired. Hope to see you on your next visit! We really like the location of the Ilikai Marina and have stayed in other condos here before but this unit is exceptional. It’s clean and nicely updated. 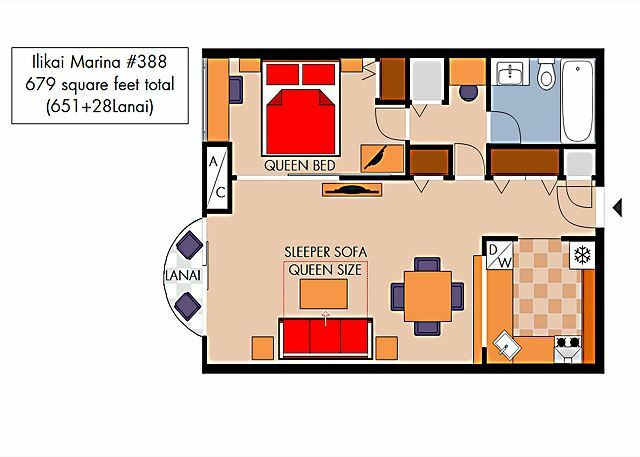 The one bedroom floor plan really works well to provide a large space for day use as well as ample privacy at night. Many reviews mentioned noise as an issue and while street noise is heard, it did not bother us or disrupt our sleep. Aloha and mahalo for taking the time to post a 5 star review and recommendation of this fabulous condo. We're glad you enjoyed your stay! 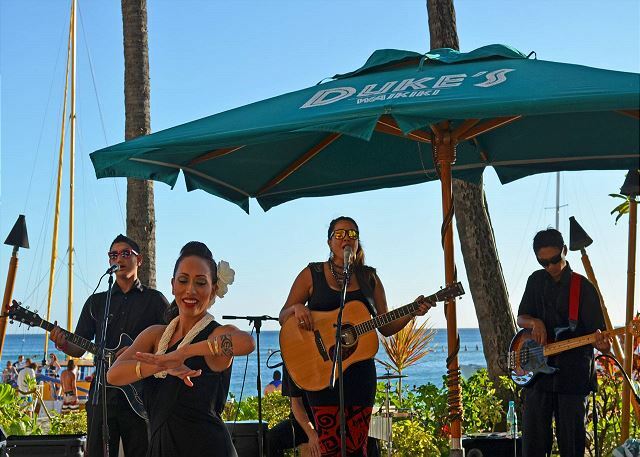 We look forward to welcoming you back on your next Waikiki visit! It was good sroom for us. More than anything,the secenery from room was healed. Somethimes customers at the bar downstairs were noisy at night....but the advantage aws superior. If there is a only one disadvantage,it is not a sofe bed. Mahalo for your time and input. So glad you enjoyed your stay and appreciated the view and scenery. We look forward to welcoming you back in the near future. Great Location, Beautiful Marina View! The property is exactly as pictured with a lovely view of the marina and ocean. The furniture was in good condition, the bed very comfortable, and the unit was clean and well-supplied with everything we needed. It has a great location - we walked to the Ala Moana Shopping Centre and into Waikiki. Easy walk to the Hilton Lagoon. Be sure to go next door to Cinnamon's Restaurant in the Ilikai - we enjoyed breakfast, happy hour and dinner on the patio. The pancakes are delicious! We did experience some noise from the Pub below, so that could be a concern if you like to turn in early, or just bring ear plugs. All things considered, for the price and awesome view, we thought it was good value. The property management provided excellent service, greeted us upon arrival and was available if needed. We have rented through Captain Cook Resorts several times now and have always been extremely happy with the service we received and would book with them again. Mahalo, for the lovely review and for choosing to stay with Captain Cook Resorts during your recent visit to Hawaii. We're so glad you enjoyed your stay and pleased that you appreciated the location of this great condo! It makes our day to read such an enthusiastic review. See you on your next trip! The condo was truly a home away from home. It's situated at the perfect end of Waikiki, walking distance to everything you need and some really nice restaurants and shops. The view of the fireworks on Friday night was terrific. Mahalo, for the lovely review! We're so glad you enjoyed your stay and pleased that you appreciated the convenient location of his great condo! Happy you saw the Friday night fireworks, you have a front row seat in this amazing condo! Thank you for choosing Captain Cook Resorts and we look forward to welcoming you back for your next Hawaiian Escape! The condo was clean and spacious, and the location is great.. easy walking distance to beaches and restaurants. Our only quibble was that the air-conditioning unit sometimes struggled to keep the condo cool, but that wasn't a major issue. We'd stay here again. Mahalo for taking the time to post this great 5 star review and recommendation! We are delighted you were very satisfied with your recent stay in this wonderful condo! I will pass your feedback on to your property manager and we look forward to seeing you on your next visit! Overall, we were very happy with the condo. It was well equipped, spacious and clean. Everything that was promised was there. Mahalo for the positive feedback and recommendation! We look forward to seeing you on your next visit! we stay there for 12 days; best Location ; only 5 min. walk to waikiki beach and to the firework on fri night. Also the view to sunset over the yacht harbour was amazing. Best App. we have ever had!! Mahalo, for the lovely review! We're so glad you enjoyed your stay and pleased that you appreciated the location and gorgeous sunset harbor views of this fabulous condo! We look forward to seeing you on your next visit! we enjoyed our stay at Ikikai Marina. The apartment was well stocked and probably a bit bigger than we expected. It was a nice change from the Hilton across the road which was madness!! The check in process was a bit confusing as we were told to contact the property manager but had trouble getting hold of him but in the end the property was just open and we could have gone in at any time. Otherwise no complaints. This condo is an ideal location to access Waikiki Beach. The condo overlooked the Illikai Marina and it was an ideal location to watch the Friday night fireworks. The beach was only a short walk away. The condo was clean and I cooked my breakfast there each morning. I could have cooked other meals there as well since the kitchen had all the utensils I needed and the ABC Store up the street provided everything I needed. It was easy to jump on the Pink Line Trolley if I needed to go further down Waikiki. I would definitely recommend this property to anyone interested in staying on Waikiki. Paul, the property manager, was very responsive and the property was very clean. Aloha Steve! Thanks so much for leaving such a great review. Happy to have provided all of the needs you required for a wonderful vacation! It's what we're here for! P.S. We think Paul is super to work with, too! Great location within easy walking distance to beach and Ala Moana mall. Great view of the boats, sunset and Friday night fireworks. Kitchen is outfitted with high appliances and everything needed for your stay. Shower is showing its age but priced plenty of hot water. Mahalo Robert for taking the time to share your comments and recommendation about your recent stay! We are glad that you appreciate the great views and location of this wonderful condo! We look forward to your next visit! This was a decent place for the price. Clean and had basic necessities well stocked. Even has some basic beach gear (umbrella, chairs etc.) The lanai was missing a chair, but was dirty (bird poop everywhere) so I wouldn't want to sit out there anyways. Location wise start of beach is about 5 mins walk away. Restaurants and corner store with necessities less than 5 mins walk. Sunsets from the lanai were gorgeous every night. The only negative for me was the location. I would have preferred something a little more closer to the middle of the beach strip. Also can get loud at night especially fri nights when people are yelling in the streets and loud music is playing at nearby restaurants (even with windows closed). Mahalo, Ruhia! We appreciate the feedback and will look forward to your next visit! The most difficult part of staying at the Ilikai Marina was finding the front of the Condo. After circling around a few times we asked an employee at the Ilikai for directions. Once we opened the front door we knew we were going to enjoy our stay. It was a very comfortable and spacious unit for the three of us. The service was great. The first night we showered we found that the tub would not drain so I called Paul and when we returned home the next day it was all taken care of. The location was perfect, close to the Ala Moana Center with no driving into Waikiki. 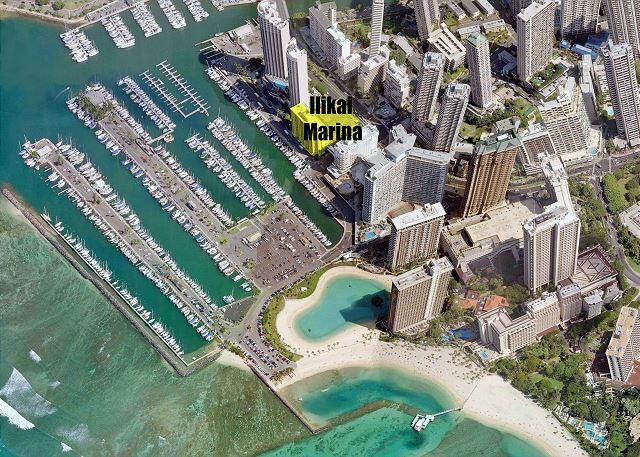 My husband and I usually stay at the Ala Moana Hotel but plan to stay at the Ilikai Marina from now on. Thank you very much for the positive comments and recommendation. We work hard to offer great accommodations and service, and we're so glad your visit was enjoyable. I will pass your feedback on to your property manager Paul, and we look forward to seeing you again soon. This was our first trip to Honolulu for the family and we wanted a place with all the facilities of home and this place ticked all the boxes but we were apprehensive as we had never booked a condo before, but we shouldn't of worried as Captain Cook Real Estate made the process easy and how they pictured/described the Condo was what it was. Our family felt at home here. The Condo was well stocked and over the ten days that we stayed we never had to replace any of the essentials provided. Paul, the property manager was prompt at assisting us and helped to provide car parking at a very cheap price in the building. The Condo is well located within a seven-minute walk to Ala Moana Mall, two minutes to the beach (you can lay on the bed and see the beach from the Condo) and a couple of Restaurants at the bottom of the building. If you don’t have a car, then the bus stop is only a minutes’ walk from the building. When we come back to Honolulu we will look at booking this place again as it provided a great base to which to see this beautiful island from. Aloha Rob and a big Mahalo for the great review and recommendation! So happy to hear your first trip to the islands turned out so well for your family and you felt at home! Hope you're able to plan a return visit soon! PS - Paul's a great property manager, we agree! Very comfortable and convenient location. Unit was very clean, the bathroom can use a little renovation . Definitely would stay again. Overall very satisfied with the condo and the service provided by the property managers. Would definitely rent again from Captain Cook. Mahalo, Elaine! We look forward to hosting you again! beautiful room and nice view. We enjoyed the firework on Friday. We spent 4 nights at the Ilikai Marina and enjoyed our stay. The condo was very clean, well furnished and had a full Kitchen. It had everything from beach towels, beach chairs, umbrella, all kitchen utensils, full size refrigerator, oven, and dishwasher. The beds were very comfortable, including the pull out sofa bed. The view of the Marina was great and the location was within walking distance to the beach and many restaurants. The Chart House restaurant is located on the street level of the building and has a great happy hour menu and drinks. We arrived late in the afternoon and the condo was quite warm. The balcony faces East, so the sun was setting directly in front of it (which makes for watching a beautiful sunset). I spoke with Paul and he said that the air conditioner was due to be replaced this year and it was best to keep the blinds closed and balcony door shut if it got too warm. Which did help. Once the sun went down a bit, it was pleasant. There was also a box fan and a rotating fan that we used which kept us at a comfortable temperature the entire time. The only other issue was that the building shut off the water for 3 hours to do maintenance (9am-12:00pm). They put a note under the door to let us know. We had plans on the North side of the island during that time, so it was not an inconvenience. Overall, we very much enjoyed our stay and will stay there again if we return to Oahu in the future. Mahalo for the great review, Kristin. We're sorry the building had a water shut-off during your stay, but glad to hear you were notified and ended up being on the North Shore anyway. We hope you are able to return to Oahu for another visit soon! We visit Honolulu once or twice a year and have stayed in 3 other Marina condos. This condo was exceptionally clean and comfortable. We were concerned about it being on a low floor, but we heard no street noise or music from the restaurant and pub below. It was actually delightful being so close to the boats in the harbor and still able to see the ocean. We did not cook, but the kitchen is beautiful and fully stocked. The bed was very comfortable. If we had to have a complaint, it would be that the bathroom light and fan are connected. Would be nice to have them separate. Also loved the tile floors than having carpet; very clean and cool. The location is perfect for us. Close to Ala Moana Shopping Center, restaurants (we love the Harbor Pub downstairs), the beach, and a nice bus ride into Waikiki. We would definitely stay in this condo again! Mahalo to Paul Tucker. Mahalo for the great review, Gary! We hope you can return for another visit soon! The stay at 388 couldn't have been more perfect. The view of the marina and ocean in the distance from the small deck was mesmerizing. The walk to a not as rocky part of Waikiki beach was about 10-15 minutes on a boardwalk passed the Hilton Hawaiian Village, but we didn't mind this at all! The Ala Mona mall is also very close by, as is the Waikiki Beach Walk, which has great shops and restaurants! The condo has all of the pots, pans, and utensils you would need to cook and is super clean. We will definitely be back! Aloha and mahalo, Corryne, for taking the time to provide feedback of your recent stay! We're pleased you enjoyed this Ilikai Marina condo and look forward to your next visit! There are two parts to our review. The first relates to using Captain Cook Resorts who managed our stay. We had not used them before. We were really impressed by the service. Communication was timely and complete. There is nothing they could change. All of the information about how to get there late at night was "spot on". The manager met us (quite late) and explained everything. When we had a bit of bother of a non related issue he helped us out. Everything was treated "low key", efficiently and effectively. Service just does not get any better. The second part is about the actual Condo. I must admit arrival does not say "5*". While there is nothing wrong, the carpet and hall paint is a bit dated. However once into the newly renovated apartment the whole atmosphere changes dramatically. It is fresh, clean and bordering on opulent. It just feels great, and that's before you have taken in the view. Once you do look out the window and across the Marina it just gets better. It is stunning. It has one of the best smallish kitchens we have ever used. It shows the difference great design makes. The appliances were top of the range. If we could buy the microwave at home we would! The bed was one of the most comfortable in any hotel, anywhere. While it has a small footprint, it does not feel small. Not long after booking this condo we started having second thoughts. It does not have it's own pool! However this is not an issue. We swam everyday, either in the Lagoon or in the warmer sea. It was a leisurely 5 minute walk past pools so crowded you would not have been able to swim 2 strokes. This Condo would make it into our top 5 choices anywhere. If I had to list 1 "could do better" it would be that the provision of a safe would have allowed us to leave our passports behind each day. We would absolutely recommend this place to a good friend and we would also encourage anyone to use Captain Cook Resorts to book. Mahalo, Michael, for the wonderful review! We're glad our reservation process worked so well for you - that's our end goal, too! We hope you're able to return for another visit some day soon! The pictures you see online are accurate and honest. Everything was clean and ready for use. The AC thermostat read 60 but felt more like 70 or so, but the unit is equipped with fans which made it just as comfortable. I love the location and the view of the harbor and the ocean was beautiful. I used the kitchen to cook dinner once and I had everything I needed as far as kitchenware. I just had to buy ingredients. The unit had beach towels, regular towels, beach chairs, fans, and even an iron with ironing board, hair dryer, and curler. I would definitely stay here again. Mahalo, Andrea, for choosing Captain Cook Resorts and the great review and recommendation! We're so glad your visit was enjoyable and look forward to seeing you again. We had a wonderful 10 day stay at Ilikai Marina, Condo #388. Everything was clean & the condo was well equipped. The beds were very comfortable and the view to the fireworks on Friday evenings was fantastic. Paul was very hospitable and friendly and gave us a good run down of the area. The condo is a little bit of a walk to the main Waikiki area, however this means you are away from the hustle & bustle as well. We really enjoyed our stay and would recommend this condo to anyone. Mahalo, Kathryn, for taking the time to share your recent experience at Ilikai Marina! We're so glad you enjoyed your stay! We will pass your feedback on to your property manager, Paul; he's a real asset to the Captain Cook Resorts team! Happy to hear your vacation was great! Hope to see you again! I've stayed at the Ilikai Marina before, but in a different unit, and like the location and enjoy watching the boats in the harbor. It's close to the mall and many good restaurants. You can't beat the view of Hilton's Friday night fireworks. This unit is fresh from a new remodel and is well equipped with new appliances. The bed was great for me. The furniture was okay but not really my taste. The only real problem I experienced was the music from the restaurant downstairs. Pretty noisy especially on Friday and Saturday nights till about 11:00pm. Great condo, enough space for 2 adults and a toddler. Convinent to beach and Ala Moana Mall. It was clean and nicely decorated. The AC was not very powerful but if you kept the blinds closed in the afternoon it would be kept it somewhat cool. Unfortunate because the view is beautiful. The microwave did not seem to work but it was not a problem for us since we had no need to use it. Overall it was a pleasant stay. Mahalo for taking the time to post a review - we really appreciate it! We are having the microwave repaired/replaced right away. Please know that our property managers are on call 24/7 for any issues that may arise during your stay. We look forward to your next visit! Staying at Ilikai Marina #388 was a great experience. It was walking distance to the Hawaii Convention Center where we had a three day educational convention and to the Ala Moana Shopping Center. We enjoyed the fireworks display Friday evening from the balcony as well as watching the evening sunsets. The remodeled unit made our stay very comfortable. The parking was affordable and we hardly encountered any crowds waiting for the elevator. We were very pleased with our stay and all agreed that we would stay there again. We recommend this property if you're looking for a nice, quiet, pleasant surrounding still in Waikiki but not in the hustle and bustle of it. Very clean, parking easy, very well supplied. Was a great experience! Condition of the room was exactly as pictured in the ad. Property manager was very easy to work with. Centrally located; close to Waikiki without getting caught in the hysteria of Waikiki. Will definitely consider renting again. Great apartment, easy walking to beaches and shopping. Well maintained, well set up. Great view over the marina and sun sets. This is not a five star place but for the price we were happy with it. Good eating places below. The experience was very good. The only deficiency were the two outdated TV sets. They are very old, and the audio on both was such that it was difficult to understand the dialog on both sets. They need to be replaced. Centralt nära havet med härlig utsikt är stor fördel. I det härliga morgon och kvällsklimatet kunde balkongen gärna fått varit större. We loved the location but the actual property was quite dated and even in it's hayday it would not have been top of the range. The property manager was a lovely guy named Paul, he did warn us that the bar and resturant clientel can be a bit noisey when they leave late at night, this was true!!! Nice place, great location. walking distance to every thing. I went to a convention in Hawaii. I am so glad that I booked through Captain Cook Real Estate. The room and location was great, and the prices was definitely cheaper than other hotels nearby. The room was close to the Convention Center, a Mall, Hilton, and a lot of different eating areas. If you need to use a bus, there are several bus stops right outside your door. And you can see the beach right outside of your window. The property was very accessible and in a fantastic location. Good value. Would recommend. Great location for the unit, having a great view with good access to food, beaches, busses, shopping and activities. Unit was comfortable and well appointed, including almost everything one would expect. We did have an issue with blocked plumbing which was attended to promptly by the management. Coming from overseas, one does not bring anything non essential on the flight, so some additional things that could be included in the unit would be salt and pepper, sugar and cooking tongs. Some labelling of switches would also be useful, e.g. the Insinkerator as the sink was partially blocked on arrival as it would appear that previous guests were not aware that it was installed. A compendium of unit instructions, brochures and "things to do" would be useful for new guests. This would assist greatly in orientation and doing the right thing. A drying rack would also be a useful addition for wet/damp bathers, towels when coming from the beach, as you are not allowed to hang them from the balcony. Overall a great unit and certainly worth recommending to others. We did consider that staying in one place for the full holiday period may be restrictive, but due to the size of the island and the excellent bus services this was not a problem at all. We loved the apartment and it's location the only thing we found was that the dishes were a little dirty and it was disappointing not to have a dishwasher but other than that it was fantastic. Overlooking the ocean and hundreds of sailboats ! Beautiful location, everything was clean, very well done ! We were within walking distance to a beautiful beach, and a gigantic open air mall ! Top drawer location wonderful Condo and Paul and the rest of the management team give 5 STAR service. We stayed 7 nights in December to celebrate Christmas with our son, who lives in Hawaii. While not plush or luxurious, this property was comfortable for 3 adults. It was as advertised. Location is ideal, near Ala Moana Shopping, Hilton Hawaiian Village, and within walking distance to many excellent restaurants and the beach. It overlooks Ala Wai Marina and we had a front row seat for the Friday night fireworks. President Obama was eating dinner across the street at Morimoto's one night. which caused some excitement. TV and WiFi worked well. I was able to cook Christmas dinner in the kitchen. The bathroom could use updating. Compared to hotels this condo was a bargain! We would definitely use Captain Cook Realty again. It was a really nice rental. The view was nice and walking distance from the beach. It could use a little remodeling though. I would recommend this to place, we would stay here agsin. Online this property presents much nicer than it is. Unit could use with some paint a major update of the bathroom and an update of dishes and utensils. More importantly air conditioner needs an update, although adequate do not expect it to be too cool in your room. The air fresher in the hallway was very strong and not pleasant. Loved the location, we were fortunate to see fireworks twice in the week we were visiting! Do not need a car walking distance to major mall, and restaurants etc. bus system is fantastic and easy to get around Honolulu - Waikiki. Get a roll of quarters if you want to do wash! We stayed two weeks at this condo. Loved every minute of it. The location is ideal. Was initially worried about possible traffic noise --street in front, etc. The only noise at times was early moring trash truck that stopped a few doors down. Short walk to Ala Moana shopping center. The food eatery has many local foods. Check out the Poor Man's Yacht Club at the marina. Not the Hawaii Yacht club, but the PMYC located on the next farthest pier. Great breakfasts. Harbor bar beneath the building is great for breakfast, drinks and take out. Gets a bit rowdy at night, but still fine. Great eats at Nikko's, Pier 38; Sam Choy's, on Nimitz Hwy; and good food and view at La Mariana Marina. I left detailed suggestions for owner of improvements for condo as he/she is planning on renovations soon. Everything about this property is good...except the bed. Not a queen as advertised and in need of replacement. The apartment had wonderful views across the mariner and right next door to see the friday night fireworks which you can watch from the lanai. Great restaurants and bars within walking distance and only a 10 minute walk to waikiki. Everything you need is available in the apartment for a great stay and I would highly recommend this apartment for those wanting to be right in the middle of entertainment and beachs with also good public transport links and shopping on downstep. Wonderful place to stay while I was welcoming my beautiful new granddaughter into the world.